The dynamics of predator-prey pursuit appears complex, making the development of a framework explaining predator and prey strategies problematic. We develop a model for terrestrial, cursorial predators to examine how animal mass modulates predator and prey trajectories and affects best strategies for both parties. We incorporated the maximum speed-mass relationship with an explanation of why larger animals should have greater turn radii; the forces needed to turn scale linearly with mass whereas the maximum forces an animal can exert scale to a 2/3 power law. This clarifies why in a meta-analysis, we found a preponderance of predator/prey mass ratios that minimized the turn radii of predators compared to their prey. It also explained why acceleration data from wild cheetahs pursuing different prey showed different cornering behaviour with prey type. The outcome of predator prey pursuits thus depends critically on mass effects and the ability of animals to time turns precisely. A pursuit between a predator and its prey involves complex strategies. Prey often make sudden sharp turns when running to evade a predator. Any predator that cannot turn quickly enough will have to run further to catch up with the prey again, thus potentially allowing the prey to pull away from the predator. The timing of these turns is crucial; if the prey turns when the predator is too far away, the predator can cut the corner off the turn and catch up with the prey more easily. The speed at which animals can turn depends on the forces involved in cornering, and larger animals need to produce greater forces for any given turn. However, larger animals can apply relatively less force than smaller animals for turns and so cannot turn as rapidly. The effect of the relationship between mass and turning ability on the strategies used during land-based pursuits had not been investigated. Wilson et al. have now created a mathematical model that considers how the mass of a predator and its prey influences the course and strategies used in a land-based pursuit. The model is based in part on a mathematical problem called the ‘homicidal chauffeur game’, where a car driver attempts to run over a pedestrian. Wilson et al. 's model predicts that chases between large predators and smaller prey should feature frequent sharp turns, as the prey try to exploit their superior turning ability. However, when the predators and prey are of similar size, the prey gain little or no advantage from executing high-speed turns. Indeed, as turning slows the prey down, turning may often be disadvantageous, and so fewer turns should be seen during a pursuit. The predictions of the model were compared with the pursuit strategies of wild cheetahs, which were studied using collars equipped with tags to measure acceleration as the predators chased prey of different sizes—from hares to large antelopes called gemsboks. The tracking data confirmed the predictions of the model; thereby revealing that body mass and the ability of animals to choose when best to turn strongly determine the outcome of predator-prey pursuits. Animals that feed on mobile prey have evolved a repertoire of anatomical features and behavioural strategies to maximize capture success (Lima, 2002), matched by prey in an evolutionary arms race in their attempts to avoid capture (Randall et al., 1995; Walker et al., 2005; Cortez, 2011). Numerous authors have examined strategies for both predators and prey in such interactions (Weihs and Webb, 1984; Domenici et al., 2011), with a particular wealth of literature on animals operating in air (Warrick, 1998; Hedenström and Rosén, 2001) and water (Domenici, 2001) with considerations ranging from turn capacity (Fish, 1999), through random turning behaviour by prey (Jones et al., 2011; Combes et al., 2012) to speed accuracy tradeoffs during decision making (Chittka et al., 2009). Such considerations appear less well developed in terrestrial, cursorial interactions with, in particular, no discussion of how varying mass between parties might affect strategy, although this has been examined in the aquatic literature (Domenici, 2001). Elliot et al., (1977) provided a conceptual model for prey acquisition by terrestrial carnivores describing four major elements; the search, the stalk, the attack, and the subdue. Of these, the attack is the most power-demanding (Williams et al., 2014), typically involving complex high speed manoeuvres (Van Damme and Van Dooren, 1999; Kane and Zamani, 2014), underpinned by apparently complicated behavioural options for both predators and prey (Estes and Goddard, 1967; Wilson et al., 2013b). In fact, operating in a planar terrestrial environment, options for both parties are restricted, being based primarily on the choice of speed (Elliot et al., 1977) and/or trajectory (Howland, 1974), with actual performance in these being determined by physical constraints that determine maximum attainable speed and limits on turn radius as a function of velocity. Maximum speed in terrestrial running animals tends to increase to an asymptote with body mass (Garland, 1983) and this process is driven by increases in leg length with body size, which facilitates higher speeds (Garland, 1983; Bejan and Marden, 2006), being ultimately limited by the scaling of body mass relative to leg strength (Alexander, 2002b). Turn radius as a function of velocity in terrestrial animals is modulated by a number of critical elements, notably the extent to which leg strength can support the forces required to generate the centripetal acceleration for the turn (Greene and McMahon, 1979; Greene, 1985; Alexander, 2002b; Tan and Wilson, 2011). In addition, important elements influencing turning mechanics and maximum turn speed are; the interplay of limb force limits (Chang and Kram, 2007) and friction limits (Usherwood and Wilson, 2005, 2006), and morphological factors (Walter, 2003; Jindrich et al., 2007; Jindrich and Qiao, 2009). Across these studies on terrestrial animals, however, the most consistent factor limiting speed during turns is force limits, with the total force demands relating to the combined effects of supporting the body mass and providing the necessary acceleration. This means that there must be a broad scaling trend in turning performance with body mass. To our knowledge though, although such scaling trends have been considered for animals operating in water and air (Domenici, 2001; Hedenström and Rosén, 2001), this has not been explicitly examined in the literature for terrestrial animals. This trend is due to the mismatch between the linear relationship of increased force demands with body size (proportional to Mass1.0), and the non-linear scaling of leg strength (roughly proportional to Mass0.66 (Schmidt-Nielsen, 1984) (but see Biewener, 1989), leading to a relative decrease in strength, and therefore turn capacity, with increasing size. The seminal work on turn performance (Greene and McMahon, 1979; Greene, 1985; Usherwood and Wilson, 2005, 2006; Tan and Wilson, 2011) has, to date, essentially concentrated on individual species, where variation with mass is of little consequence except in an absolute sense. However, where species interact, we would expect this mismatch to have profound implications, and perhaps nowhere more than in predator-prey interactions during pursuit. This work investigates the implications of mass in modulating options for terrestrial mammalian predators during the attack phase of attempts at prey capture. We limit ourselves to terrestrial predation because mass effects have already been examined for organisms in fluid media (Domenici, 2001; Van den Hout et al., 2010) and because dealing with animals that operate in a 2-dimensional surface obviates many of the complexities associated with the energetics of changing height in aerial animals (Weihs and Webb, 1984). In order to tease out expected trends, we use a simple model that isolates only the features of mass relevant to force demands, and mass-linked capacity for force production. Thus, we assume, among other things, that both predators and prey are geometrically similar (which ignores compensating mechanisms such as upright posture and more robust limbs of some large animals as well as variation in traction) and that the chase environment is flat, open and homogeneous (Howland, 1974; Wilson et al., 2011). We propose that the attack phase of pursuit predators is essentially what has been treated within theory encompassing the ‘homicidal chauffeur’ game (Marec and Van Nhan, 1977), where a car driver attempts to hit a pedestrian in a defined open space. In this, we divide trajectories of both parties into straight line and turn sections and, by adopting a game theory-based approach (Dugatkin and Reeve, 1998; Lima, 2002), we distil out simple objectives for both parties; predators should attempt to minimize their distance to the prey, while prey attempt to maximize this distance (Weihs and Webb, 1984). To date, the most notable attempt to define the predator-prey chase scenario is the work by Howland (1974), who defined many of the rules and consequences for a single turn gambit and we use this work as a starting point. However, a large body of theory also exists (notably Wei et al., 2009 and references therein), particularly that dealing with the best strategy for missiles to engage with their targets to maximize strike probability (Shneydor, 1998; Siouris, 2004) and this is also considered within our terrestrial pursuit scenario. Specifically, our work has four elements. Firstly, for predator and prey mass equivalences, we examine how the initiation of a turn by a prey being pursued by a predator affects the change in predator-prey distance according to speed and timing, before extending the single turn scenario up to multiple turns. Secondly, we consider how differential masses between predators and prey affect the outcome of single turn manoeuvres. 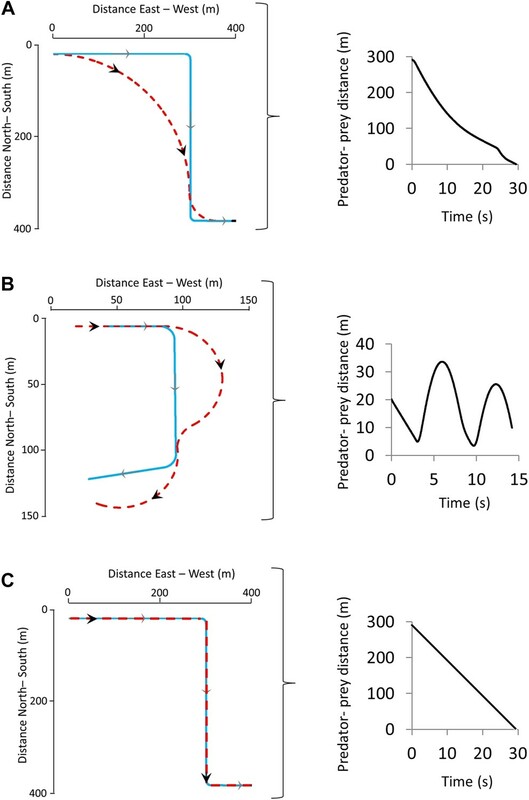 Third, we then use acceleration data acquired from tags deployed on free-living cheetahs pursuing prey of varying masses (Hayward et al., 2006) to consider whether our model predictions are broadly manifest in the wild. Finally, we compile data on the masses of mammalian predators and their prey to examine whether our model explains general patterns in prey size selection (Carbone et al., 2007). Our approach reveals that the dynamics of movements by predators and prey of varying body masses can be treated within a single framework where the classifications and likely outcomes of pursuits, as well as the relative sizes of predators and prey, seem largely dependent on simple physical rules. 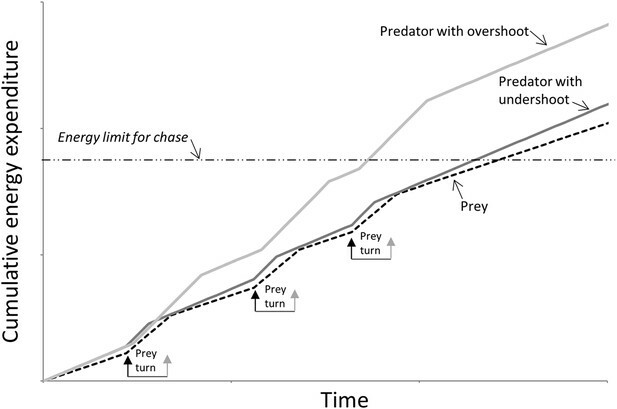 Our model for deriving the characteristics of a defined turn as a function of speed in equivalent-sized predators and prey predicted that single turns initiated by the prey lead to one of primarily two phenomena: Either the predator cuts the corner, reducing the predator-prey distance (Figure 1A) benefitting the predator, or it overshoots the corner, increasing the predator-prey distance (Figure 1B) benefitting the prey. 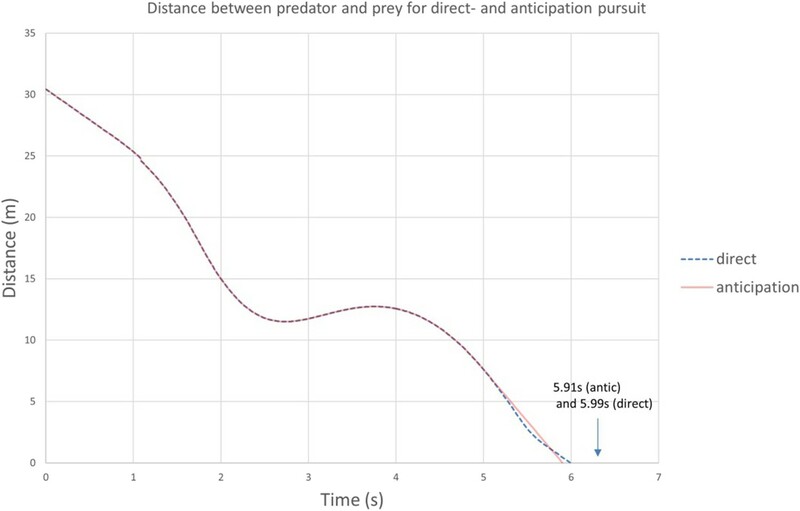 A third scenario might be where the predator follows the prey trajectory precisely, in which case there is no change in benefit to either party although in this circumstance, the predator, with its higher speed, will eventually converge on the prey (Figure 1C). Although a single turn may not lead to capture or escape of the prey, multiple turns with consistent undershooting by the predator can do so (Figure 1). For any given turn, the change in predator-prey distance over time was predicted to be critically dependent on; (i) the distance between the parties at the moment of the turn (Figure 2A), with shorter distances (for distances >0) at the moment of the turn leading to greater overshoot by the predator, (ii) the difference in speed between parties (Figure 2B), with greater speed differences leading to greater overshoot by the predator, and (iii) the reaction time of the predator (Figure 2C), with slower reaction times leading to greater overshoot. Two sequential prey turns during predator-prey pursuits showing the trajectories (left-hand figures) adopted by both prey (blue lines) and predator (red lines) during instances of turns that are (A) too early or (B) correctly timed by the prey, leading to corner-cutting or overshooting, respectively, by the predator. (C) shows the scenario where the predator and prey adopt identical trajectories. The right hand figures show how the distance between the predator and prey varies with time for the shown trajectories. 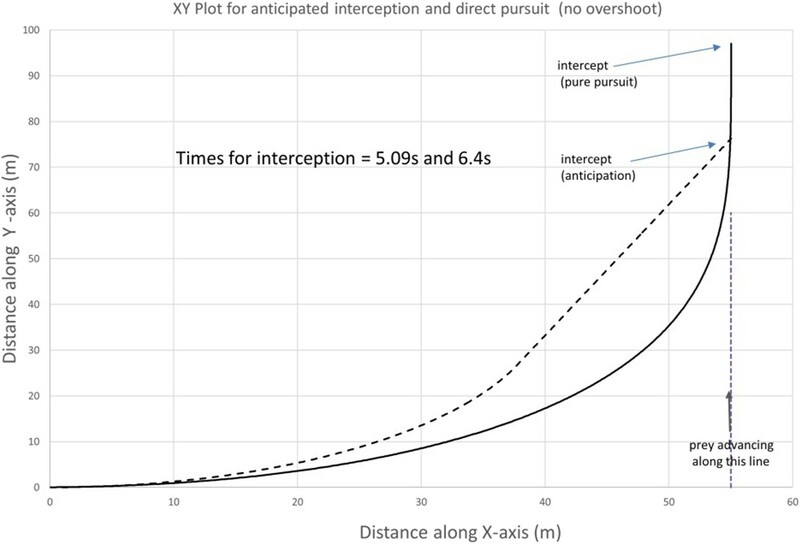 Predator-prey distance during pursuit as a function of time during an execution of an unexpected 90° turn by the prey followed by straight-line travel, for; (A) different predator-prey distances at the moment of the execution of the turn by the prey (indicated by the dashed vertical line) [reaction time of the predator = 0.3 s, predator and prey speeds 20 and 15 m/s, respectively], (B) different predator speeds (black line shows a speed of 18 m/s and increasingly pale lines show speeds of 19 and 20 m/s respectively) [reaction time of predator = 0.3 s ] (C) different reaction times by the predator (black line shows a reaction time of 0.5 s and increasingly pale lines show reactions times of 1.0, 1.5 and 2.0 s, respectively) [predator and prey speeds = 20 and 15 m/s, respectively]. Where predators and prey have different masses, the model predicted mass-dependent distances travelled in a given turn, with larger animals having to run farther during cornering (Figure 3). Thus, during a single 90° turn, a 250 kg predator (an example of which may be a lion or tiger) is predicted to have to run farther than all considered prey (potential prey ranging between a 3 kg and a 200 kg), whereas a 30 kg predator (e.g., a cheetah or a wolf) is predicted to travel shorter distances during a turn than 3 of the 5 prey masses considered (Figure 3). Thus, cornering is predicted to be more advantageous as an escape manoeuvre as the prey size decreases relative to that of the predator and we would expect to see evidence of that in wild animal data. Predicted difference in distance travelled during a 90° turn by two different predators, one of mass 30 kg (e.g., a cheetah or wolf—continuous grey lines) and one of mass 250 kg (e.g., a lion or tiger—black dashed lines) compared to that travelled by prey of various masses (indicated by different symbols) as a function of running speed. Prey masses might correspond to for example, 3 kg—a hare, 10 kg—a steenbok, 40 kg—a springbok, 100 kg—a white-tailed deer, 200 kg—a hartebeest. Positive values show a greater distance run by the predator, negative values show greater distance run by the prey. Note that not all speeds reach 15 m/s due to the smallest prey not being predicted to reach this maximum (see text). This prediction could be examined in the data derived from the fieldwork on free-living cheetahs, where we observed 36 pursuits involving 7 prey species (Table 1), of which 33 had corresponding acceleration data for 5 species totalling 899 s.
Two species were pursued where no corresponding acceleration data were available. Identifying cornering behaviour via lateral g-forces, we documented a total of 547 turns within all chases from all animals. In these, there was a significant interaction between prey species and turn number (turns were sequentially numbered within each chase) on the rate of turn: specifically, different prey species had different turn rates as the turn numbers progressed (Figure 4) (χ2 = 11.13, p = 0.03, df = 4) (Table 1). We also noted that cheetah turns became shorter as the chase progressed (Spearman's ρ = −0.347, p < 0.0001, although g-values reached during turns did not change significantly over time (ρ = 0.031, p = 0.72). Critically, these dynamics were different in successful and unsuccessful pursuits. Turn duration decreased with increasing turn number within any particular chase (χ2 = 26.52, df = 1, p < 0.0001) and turn durations were shorter in successful pursuits (χ2 = 6.24, df = 1, p = 0.013). 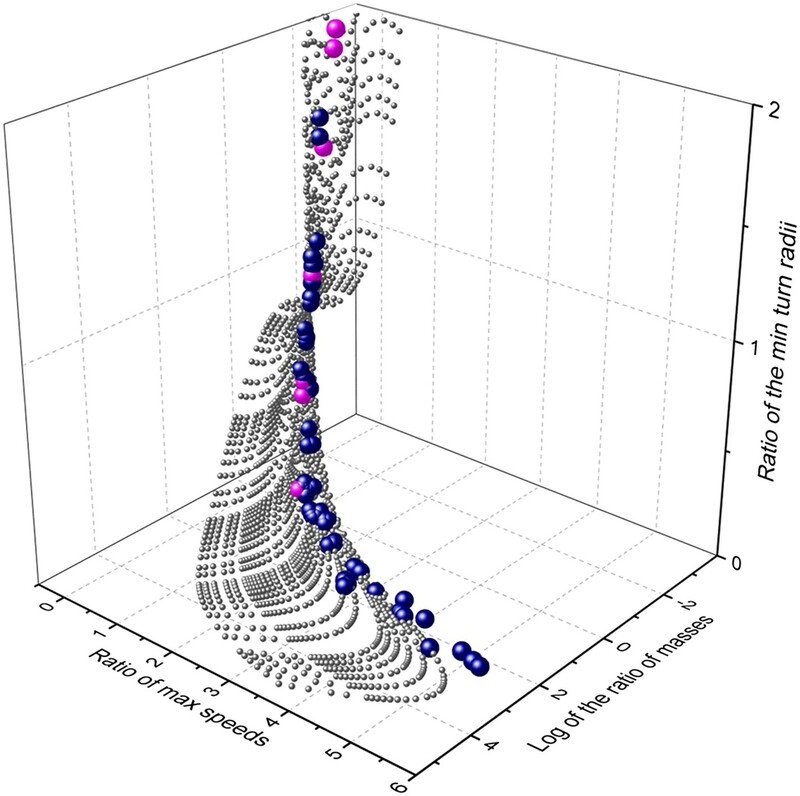 The duration of turns (expressed as the length of time between the onset of the turn and the point at which maximum g was reached within the turn) made by cheetahs pursuing different prey with time into the chase. Joined points show chases referring to individual prey. Longer turns will tend to have larger turn radii so while, overall, pursuit of larger prey is characterized by larger turn radii, turn radii diminish as the chase progresses. Extending our modelling exercise to derive maximum cornering ability as a function of mass and speed for a suite of theoretical mammalian cursorial predators and their prey indicated that, within the animal mass range considered, mass affects maximum speed (by a factor of less than 6) much less than it affects minimum turning radius at maximum speed (which affects it by a factor of up to 260). This is due to the combined effect of generally increasing maximum speeds with mass (see above) and the additional effect of mass on turn radius (Figure 5). Importantly though, the surface describing comparative turn abilities showed that predators turn tighter relative to prey in a specific area of the surface defined in terms of predator and prey mass ratios (Figure 5). Insertion of the mean mass of 54 species of canids and felids and their (predominantly mammalian) prey from an extensive database (Carbone et al., 1999) into this plot, shows that all predators were located in the area where predator turn capabilities were maximized compared to their prey (Figure 5). 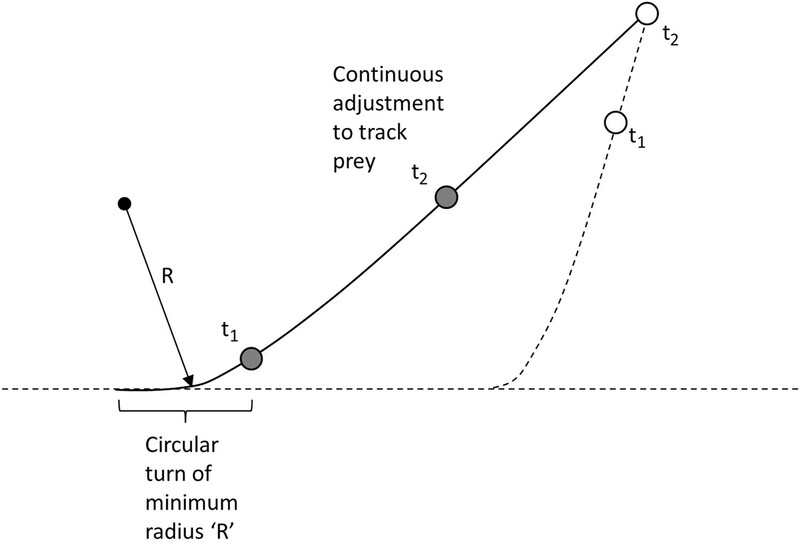 The implication from this is that there is strong selection pressure for turning ability in predators and that (i) predators evolve to take particular sized prey with a mass that results in the minimum turn radius ratio most in favour of the predator, and/or (ii) prey sizes that have minimum turn radii that most closely accord with those of the predators tend to be caught more often than other-sized prey. Relationship between mass and performance for predators and prey derived from the model. Performance is expressed as maximum speed ratio (Vmax pred/Vmax prey; higher values indicate relatively faster predators) and minimum turn radius (Tmin prey/Tmin pred; higher values indicate relatively tighter turning predators). The grey spheres indicate the range of possible options computed systematically, the blue spheres represent single predator species computed against their mean prey masses, while the cyan spheres indicate the specific case of the cheetah, taking variously sized prey items across the size range. The outcome of a predator-prey pursuit depends on performance, both in terms of speed and cornering capacity (Wilson et al., 2013a, 2013b), and how these relate to power requirements and timing. Our work echoes that of Howland (1974), which dealt with the same issue using a different approach, emphasising that high speed, aside from being necessary for the predator to gain on the prey, also increases the likelihood that the predator will overshoot the prey turn trajectory (Figure 1B) (Howland, 1974; Alexander, 2003). Conversely, as speed decreases, the difference in distance covered during any turn between predator and prey decreases (Figures 1–3), fulfilling the fundamental game rule for the predator. The optimum strategy for a pursuit predator should, therefore, be to attempt to elicit turns by the prey which, if the prey are working close to maximum power, will result in a reduction in their speed (Shubkina et al., 2012), because energy is needed for the turn (Wilson et al., 2013c). Invoking multiple rapid turns might therefore be a strategy that predators seek to promote. 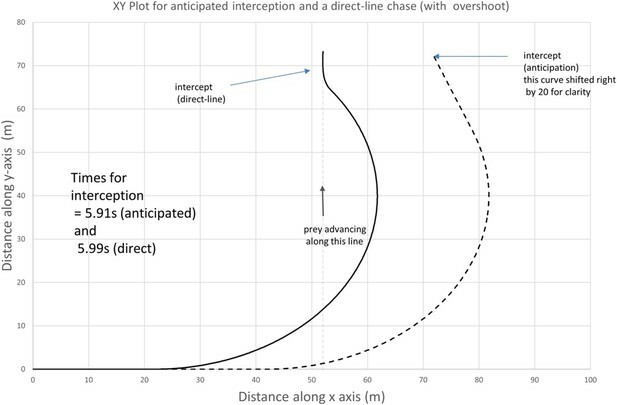 Here, decreasing turn duration over time is expected during successful chases, as we observed (Figure 4), coupled with generally decreasing speed, as reported by Wilson et al. (Wilson et al., 2013b). However, turning is also critical for survival of prey because maintenance of a straight line trajectory leads to inevitable capture if the predator is faster. This seemingly contradictory situation of whether the predators or prey benefit most from prey turns is clarified by timing. When the predator is far from the prey, the prey should not turn since to do so allows the predator to cut the corner of the prey's trajectory and decrease the distance between itself and the prey more rapidly (Eilam, 2005) (Figure 1). However, turns by the prey do benefit the prey if the timing is correct because this leads to an overshoot by the predator (Figure 1, Figure 2). Where such overshoot turns are consistent, they should generally lead to rarefying turn rates with reduced chances of capture (Wilson et al., 2013b). The outcome of extended pursuits is also likely influenced by endurance. Both parties will have power limitations restricting their options on instantaneous performance, as well as ultimately limiting how long the chase can continue before exhaustion. A multiple turn terrestrial chase has energetic costs associated with straight line travel that are a (linear) function of speed (Taylor and Heglund, 1982) so, all other things being equal, at such times the predator should be expending energy faster if it is to gain on the prey. However, there are substantial costs to turning above those of straight line travel (Wilson et al., 2013c) so the angular extent of the turn and the time spent turning will both affect the rate of energy expenditure (Wilson et al., 2013c). Thus, where the predator cuts the corner compared to the trajectory taken by the prey (Figure 1), the reduced turn costs should act to reduce its overall rate of energy expenditure, making the predator energy expenditure closer to that of the prey. This will tend to lead to similarity in power use between parties resulting in similar giving-up times, assuming both parties can allocate similar amounts of energy to a pursuit (Figure 6). However, where a predator overshoots the cornering trajectory of the prey (Figure 1), it has to contend with the increased energetic demands of travelling farther, and with a greater turn angle, than the prey (Figure 2). Thus, where overshooting occurs consistently, it will tend to make cumulative energy expenditure between the two parties more disparate resulting in the predator reaching endurance limits earlier than the prey (Figure 6). In reality, multiple turn pursuits, such as we observed in our cheetah-prey interactions, will consist of a both corner-cutting and overshooting by the predators with the proportion of either perhaps biasing the likelihood of prey capture or the chase being abandoned. Schematic figure to show how power use is expected to vary during the course of a predator-prey chase consisting of four straight-line trajectories interspaced with three turns (turns made by the prey are shown between arrows) by both parties. The prey (dashed line) has lower energy expenditure than the predator during straight-line sections because it is travelling slower. However, because extra power is required for a turn (Wilson et al., 2013c), a predator that consistently cuts the corner (dark grey line—‘predator with undershoot’—cf. Figure 1) spends less time cornering, expending less energy for the corner, and may maintain energy expenditure at levels similar to those of the prey despite travelling faster: Here both parties may reach limits to endurance performance at a similar time. However, a predator that consistently overshoots the corner (light grey line—‘predator with overshoot’—cf. Figure 1) spends longer turning, expending markedly more energy than the prey at all times, reaching endurance limits earlier. (In this depiction, predators and prey are assumed to have the same geometry, performances and masses). Our data and theoretical considerations based on the literature highlight the extent to which mass drives physical abilities in predator-prey pursuits. The fact that maximum speed generally increases with mass (Garland, 1983) has been variously linked to factors such as absolute and relative leg length, stride length and stride frequency (cf. Schmidt-Nielsen, 1984; Biewener, 1989, 2003; Alexander, 2002a). This is complicated by the degree of geometric similarity between animals and models for elastic similarity (cf. Garland, 1983 and refs therein), all factors which might also help explain the modest reverse trend in the maximum speed vs mass relationship for animals exceeding about 70 kg (Garland, 1983). That greater mass leads to greater turn radii, because the forces that animals can exert for a turn relate to a mass exponent of less than one, whereas the forces required for a turn scale to a mass exponent of one has not, to our knowledge, been previously discussed. Both these mass-dependent attributes lead to a tendency for larger animals to be faster, but less able to turn than smaller animals, which presumably has profound consequences for strategies adopted by predators and prey during pursuits. Mass-linked performance explains why, for example, smaller cheetah prey confer a greater size-derived speed advantage to the predator, which should lead to a more rapid closure of the cheetah-prey distance during straight line sections of the pursuit and result in a predicted, and observed, higher turning frequency in cheetah pursuing smaller prey (Figure 4, Table 1). Similarly, our mass-dependent model of performance points to how predator size in relation to that of the prey results in differential distances travelled by both parties during turns. So the distance run during any given turn by a predator with similar mass to its prey should not be markedly greater than its prey, while a larger predator chasing the same prey must contend with covering a substantial increase in the distance travelled (Figure 3). However, the scaling of turning radius with speed is complex because either party may elect to travel more slowly to produce a tighter turning radius, which also reduces the chances of mistakes (Chittka et al., 2009), although the predator must always presumably travel faster than the prey. Certainly, workers have suggested (Wilson et al., 2013a), and found (Wilson et al., 2013b), that cheetahs tend to reduce speed in the final stages of their chases (cf. Shubkina et al., 2012). Thus, varying masses between predators and prey changes the nature of pursuits substantially. Pursuit predators up to body masses of about 70 kg would seem to need to be larger than their prey in order to be able to catch them because, up to this size, larger animals can run faster (Garland, 1983; Bejan and Marden, 2006). But larger-bodied predators must modulate speed carefully to compensate for their turn radius disadvantages because, although they can outrun, they are less likely to out-manoeuvre their prey (Figures 3, 4). Therefore, chases are expected to be defined by more frequent turns with increasing mass differential between parties, which is what we observed in our cheetah data (Table 1). Where predators pursue prey larger than themselves, however, and assuming that the predator can travel faster than their prey, there is no advantage to be gained by the prey executing the sudden turns characteristic of small prey (cf. Figure 4). This explains the straight-line trajectories of for example, gemsbok Oryx gazelle being pursued by spotted hyaenas Crocuta crocuta (Mills, 1990). The primary deterrent to smaller predators hunting larger animals may come from the danger of injury (Mills, 1990), or the predator not having the strength to overcome its prey, something that can be mitigated to an extent by co-operative hunting or following the prey to exhaustion (Estes and Goddard, 1967). Our treatise assumes that both predators and prey interact on a homogeneous, flat surface but we expect any variation in the topography and vegetation to modulate the tactics adopted by both predators and prey. Shepard et al., (2013) note how substrate type affects the costs of animals moving over it (hence their term ‘energy landscape’), which is predicted to affect route choice in a general sense. We expect high power pursuits of the type discussed here to be subject to the same rules, with changes in the energy landscape that differentially affect predators and their prey to be exploited by the relevant party. Of particular note is the work by Taylor et al., (1972), who noted that larger animals incur a proportionately greater increase in metabolic rate for movement up inclines, and this has been shown to affect area use in some species (Wall et al., 2006). Correspondingly, we would expect smaller prey to favour selection of uphill gradients during pursuits. Similarly, smaller prey are expected to ‘run for cover’ (Domenici et al., 2011), partly because such cover may represent an impossibly high-cost energy landscape for the predators. In addition, vegetation in patches, such as bushes or trees, may constrain turn radii, precluding small prey from perhaps turning as tightly as they might, to the advantage of the predator while, conversely, such features may allow prey to execute a turn without giving the predator the option of cutting the corner (Figure 7). Pursuit of a steenbok which has turned as it ran past a bush, constraining the cheetah to follow almost the same trajectory. The use of environmental features such as this makes the timing of the turn less critical since the cheetah cannot cut the corner substantially, even if the prey turns too early. Within the general context of predator-prey pursuits, some authors have noted that unpredictable (protean) movement by prey can enhance their chances of escape (Jones et al., 2011). The theory is that unpredictable movement may catch the predator by surprise (Humphries and Driver, 1970), not least because, in our case of cursorial predator-prey interactions, the prey may execute a turn when the predator-prey distance is not yet critical. Clearly, if this occurs in planar environments, choices for changing trajectory can only amount to movement that is either left or right, and should not be executed too early where there are substantial corner-cutting benefits to be gained by the predator. However, since the timing of corners would appear so critical (see above), we would expect selection pressure for random turns just before the critical phase. Future work would do well to consider this. Finally, predator-prey pursuit options by terrestrial animals will undoubtedly be altered when the condition changes from single to multiple predators. Here, observed manoeuvres are complex and include fanning out of predators (Kelley, 1973; Mills, 1990) which should allow larger predators to mitigate for the effects of their reduced turning radii with respect to those of their prey. Indeed, understanding the precise advantages of group hunting as a function of group size, predator and prey masses, and the distribution of all parties in space in relation to environmental variability promises to be a major challenge. There are a number of different strategies recognised within ‘pursuit’ scenarios (e.g., athletes chasing balls, children’s games of ‘tag’, missiles, and insects involved in territorial disputes) including, primarily ‘pure’ pursuit, and more ‘predictive’ strategies such as ‘constant bearing’ pursuit, and ‘constant absolute target direction’ (CATD) pursuit (for definitions see Shneydor, 1998; Wei et al., 2009; Nahin, 2012). Constant bearing is only applicable if the speeds of both parties are constant (Reddy, 2007), which is generally inappropriate for predator-prey terrestrial pursuits (Wilson et al., 2013b) although its use has been demonstrated in some predatory insects (Olberg et al., 2000), fish (Lanchester and Mark, 1975) and humans (McBeath et al., 1995), while CATD has been shown in some birds, as has ‘pure pursuit’ (Kane et al., 2015). We expect, however, pursuit strategies for flying animals (and some latter-day missiles) to differ from those of terrestrial animals. This is because initial engagement between two aerial parties invariably involves both moving prey and the pursuer having an approach that tends to occur at a tangent to the target (Hedenström and Rosén, 2001; Ghose et al., 2006), rather than from directly behind. Part of the reason for this tangent relates to both predators and prey operating in 3-d, rather than 2-d, space so that the simple probability of a line of attack being directly along and behind the prey flight path at first encounter is correspondingly reduced. Tangential approach provides various options for pursuers to calculate trajectories and compute intersection points (Olberg et al., 2000) that minimize time and/or distance (Ghose et al., 2006). It also helps mitigate manoeuvring problems likely to occur during pure pursuit as the inter-party distance approaches zero (particularly where pursuer speed is much greater than that of the prey) (Siouris, 2004). The development of the chase for a cursorial predator operating in the planer environment of the ground, however, invariably starts with a stalking phase on essentially non-moving prey followed by the rush (Estes and Goddard, 1967; Elliot et al., 1977; Mills, 1990; Williams et al., 2014). This situation is very different from some modelled interactions where both predators and prey have constant speed (e.g., Weihs and Webb, 1984). Two options would seem appropriate for predator-prey encounters that start prey at, or close to, zero speed in planer environments faced with a predator moving rapidly towards them. One, which is more appropriate where the predator speed is markedly higher than prey and the distance between them small, involves prey escaping in a trajectory that is perpendicular to that of the predator (Weihs and Webb, 1984; Stankowich and Coss, 2007; Domenici et al., 2011). In part, this ‘side step’ strategy capitalizes on the speed-linked smaller turn radius of the prey compared to the predator. Otherwise, if prey react to a distant, but approaching, predator by generally moving away, the speeds of both parties will tend to become better matched over time. Here, the best strategy is for prey to continue to move directly away because any other direction will reduce the inter-party distance correspondingly (cf. Domenici et al., 2011). This explains observations reporting that prey typically do indeed initially run directly away from the predators (cf. Finney et al., 1997; Broom and Ruxton, 2005; Eilam, 2005) although this is not always the case (see review in Domenici et al., 2011). This manoeuvre puts the pursuer directly behind the prey. During the ensuing pursuit phase, straight line pursuit by the predator towards the prey is the only viable predator option when the prey travels in a straight line (ignoring topographic complexity —see ‘Discussion’), which is also what has been observed (Shubkina et al., 2012 and refs therein). As the predator-prey distance tends towards zero, the prey must turn to avoid capture, and may even have particular strategies such as stotting to enhance this (Stankowich and Coss, 2007). We demonstrate later that there is considerable selection pressure on the prey to time this turn so that it occurs close to the contact point (but not so close that the predator catches it). This scenario reduces differences, in both trajectories and time to contact, between the different pursuit strategies (see above) although any predictive pursuit options typically have a reduced trajectory length and time to contact than pure pursuit (see below). Differences between the pursuit strategies are also likely reduced by prey reaction to the approaching predator based on the prey having properly informed assessment of predator trajectory. In this regard, typical terrestrial ‘prey’, such as ungulates, have large panoramic visual fields with laterally facing orbital margins (Heesy, 2004) and so may be able to assess the movements of their pursuers as well as their pursuers can assess them. Indeed, escape trajectories may be modulated to keep predators within the prey's visual (or other sensory) fields (Domenici et al., 2011). In any event, the substantive differences between terrestrial and fluid media interactions may partly account for the reason that Shneydor (1998) considers that many terrestrial cursorial predators adopt pure pursuit (hence the name ‘hound-hare pursuit’), something that is backed up by observation (Schaller, 2009; Shubkina et al., 2010, 2012). Importantly though, quantitative differences in trajectories and pursuit times between pure- and predictive pursuit strategies do not change qualitative patterns. Thus, the essential message of the work, which considers mass effects, does not depend on our choice of pursuit strategy. A. That predator-prey interactions occur in a flat, homogenous area, otherwise lacking physical structure (Marec and Van Nhan, 1977; Melikyan and Bernhard, 2005) and with no differential power requirements according to trajectory direction (Shepard et al., 2013). B. That only the pursuit phase of a hunting predator is considered (Elliot et al., 1977). C. That distance between predator and prey is chosen as the primary focus of the model, with prey maximizing instantaneous distance (Weihs and Webb, 1984). D. That both predator and prey are solitary. E. That both predator and prey are geometrically similar. F. That prey operate close to maximizing energy input to locomotion during the chase although the predators are not required to do so. We represent the pursuit of prey by plotting trajectories based on vectors representing a predator moving directly towards the prey at a speed greater than that of the prey. We then modify trajectories according to the model (see below). We define the pursuit as consisting of two fundamental stages; stage 1, which involves straight line travel by the predator towards the prey and, if the prey is not caught immediately, straight line travel by the prey in response to this, and stage 2, where the prey initiates turns to reduce the chances of being caught and the predator responds by turning during pursuit. Illustration of the heading Φ of a prey to a predator at a time treact after the prey begins to move. D is the distance between the predator and prey after the predator's reaction time. iv. the predator's speed must exceed that of the prey in order for it to gain ground, so that, other things being equal, the predator will have a greater turn radius and overshoot the prey (cf. [Wilson et al., 2013a]). A. The predator will initially move towards the prey using its minimum turn radius at that speed and will continue this turn until such time as its velocity vector is aimed directly at the prey. B. Thereafter, the predator will aim directly at the current position of the prey, until such a time as the prey is either caught or the prey turns in a new direction (Figure 9). Modelling the predator's movement as an initial turn of minimum radius followed by continuous alteration of direction to track moving prey. We note that the predator may adopt strategies other than direct pursuit, such as aiming for the place that the prey is predicted to be after a defined time. While these strategies lead to differences in distance run by the predator until contact with the prey, or time to intercept, they do not change the general functional response in the variables we examine for the purposes of examining the effect of mass on strategies. where r is the radius of the turn. where we assume that k is nominally a constant (although there will be appreciable variability given the variation in animal morphology). However, for example, taking a cheetah of mass 30 kg running at 20 m/s, with a minimum turn radius of 40 m (Wilson et al., 2013a), k would be approximately 3100 and, for convenience, we use this value in our model (noting assumption (e) above). 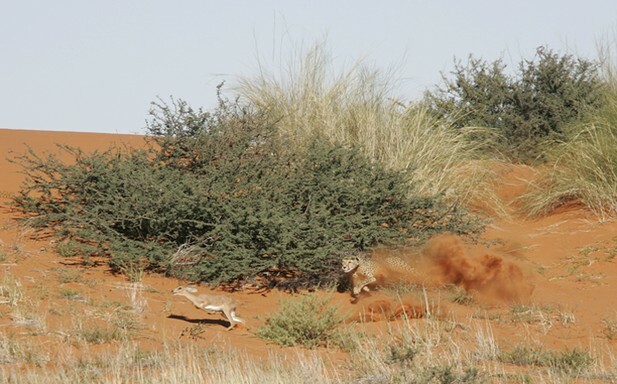 We examined the perspectives from our models with respect to prey pursuit behaviour observed directly, and quantified using collar-fitted tri-axial accelerometers (G6a, Cefas, UK —recording rate 30 Hz), on six free-ranging cheetahs in the Kgalagadi Transfrontier Park (25°46′S 20°23′E), southern Africa. Cheetahs, which varied in mass between 30 and 45 kg, were equipped for a total of 66 animal days during which 36 pursuits of prey were observed. 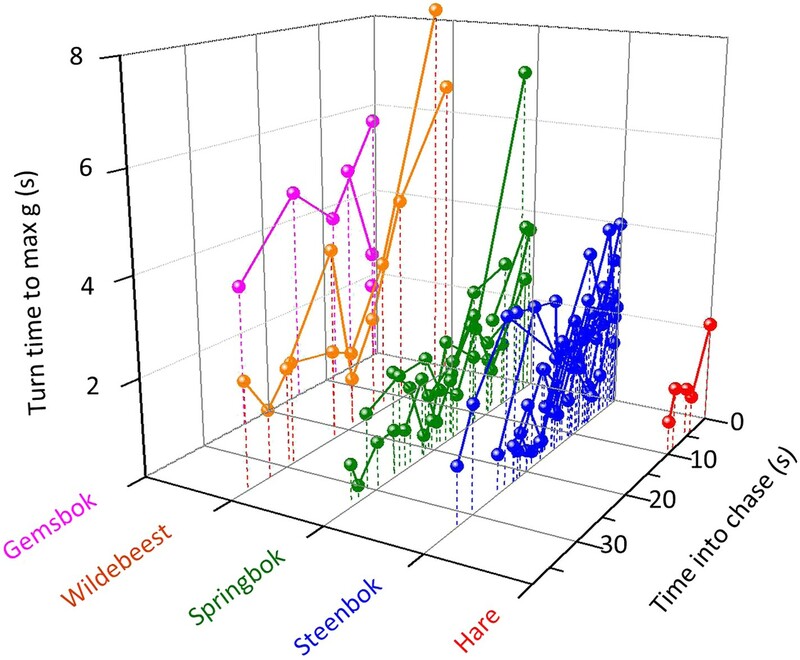 The orthogonal, tri-axial acceleration data were first sorted to identify the periods of active pursuit by matching times with periods when the animals were observed to hunt. Data from the sway and heave axes were somewhat interchangeable due to a partially rotating collar, but co-varied directly and changed with lateral acceleration and thus cornering behaviour (the surge axis varied with longitudinal acceleration or deceleration). 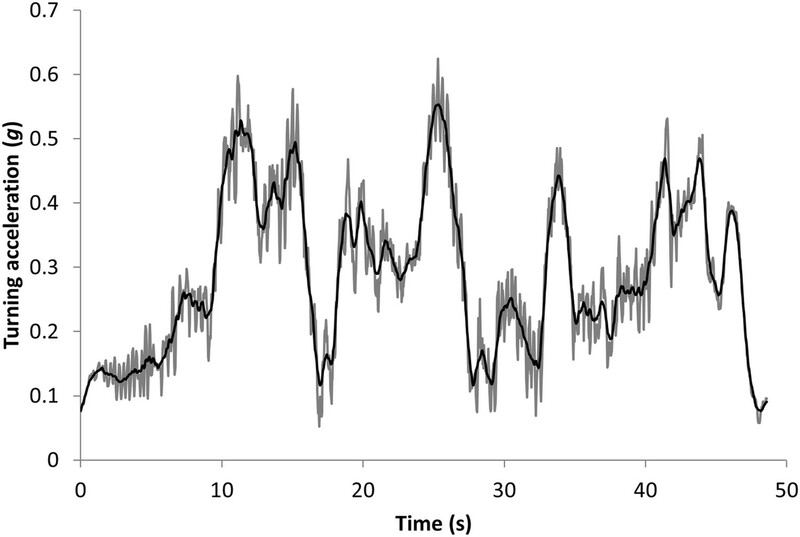 Thus, the mediolateral acceleration data (heave and sway axes) were initially smoothed over 2 s to derive a measure of the static (nominally gravity-based) acceleration (Shepard et al., 2008) and were found to show obvious waveforms due to the bounding gait of the cheetahs (Figure 10). These data were thus further smoothed over 0.5 s to minimize the influence of these waveforms while not overly compromising smoothed values (Figure 10). Turns were identified as increasing departures of the doubly smoothed data from 1×g. The specific points of their maxima were identified by values that departed maximally from 1.0. Immediately adjacent (and lower) peaks which occurred as a result of the bounding behaviour (which could be readily identified in the single-smoothed data—see Figure 10) were precluded. Data showing the vectorial sum of the static heave and sway acceleration axes (expressed as a departure from 1) during the pursuit phase of a cheetah hunting a steenbok. The grey lines show the values using a running mean window of 2 s, which still shows appreciable signal noise due to the bounding movement of the animal. These values have been further smoothed over 0.5 s to give the black line which shows the main features of the lateral acceleration during turns with maximum g-forces developed during turns displayed as peaks. Analyses of these data were performed in R version 3.0.2 (R Core Team, 2013). The relationship between prey species, hunt success and turn number on turn rate was determined using a general linear model (Bates et al., 2013). Turn number was entered as a covariate, prey species and hunt success as factors and cheetah ID as a random factor to account for repeated measurements within animals. The relationship between turn number and hunt success on turn duration was determined using a similar model with turn number entered as a covariate, hunt success as a factor and cheetah ID a random factor. For both models, function ‘lmer’ was used in the package lme4. Wald χ2 statistics and p values were obtained using the function ‘Anova’ in the package ‘car’. Data were tested for normality and homoscedasticity of variance using Shapiro–Wilk and Levene's tests. We then took data from an extensive data base on the mass of mammalian predators and their mammal prey (Carbone et al., 1999) so as to place data from wild animals in this context to determine whether any trends were apparent. Integrative and Comparative Biology 42:1060–1064. Integrative and Comparative Biology 42:158–164. Journal of Experimental Biology 209:238–248. Journal of Experimental Biology 210:971–982. The Journal of Experimental Biology 215:903–913. Comparative Biochemistry and Physiology Part A 131:169–182. The Journal of Experimental Biology 214:2463–2473. Neuroscience and Biobehavioral Reviews 29:1181–1191. Canadian Journal of Zoology 55:1811–1828. The Journal of Wildlife Management pp. 52–70. 394–406, International symposium on unmanned untethered submersible technology, University of New Hampshire Marine Systems. 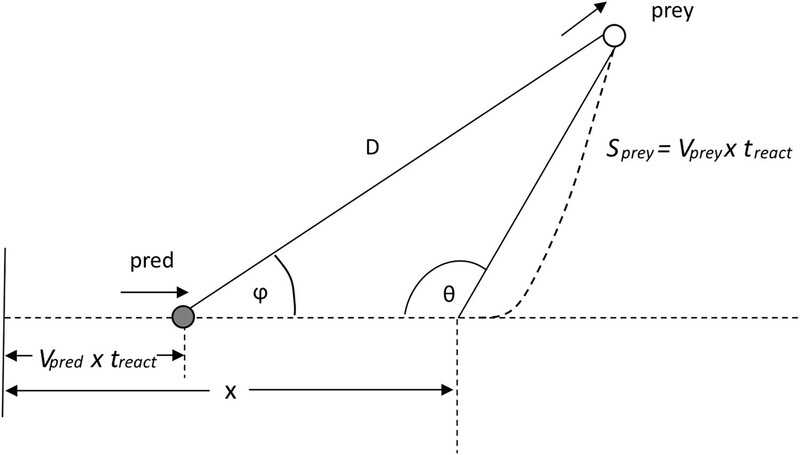 Journal of Biomechanical Engineering 107:96–103. Prey preferences of the cheetah (Acinonyx jubatus)(Felidae: Carnivora): morphological limitations or the need to capture rapidly consumable prey before kleptoparasites arrive? The Anatomical Record Part A 281:1104–1110. Journal of Theoretical Biology 47:333–350. Journal of Experimental Biology 210:1378–1390. The Journal of Experimental Biology 218:212–222. The Journal of Experimental Biology 217:225–234. The Journal of Experimental Biology 63:627–645. Trends in Ecology & Evolution 17:70–75. Journal of Optimization Theory and Applications 23:305–345. Applied Mathematics and Optimization 52:23–37. Journal of Comparative Physiology A 186:155–162. R: A language and environment for statistical computing. R foundation for statistical computing, 2013 Vienna, Austria, ISBN 3-900051-07-0, URL http://www.R-project.org. Behavioral Ecology and Sociobiology 36:243–250. Proceedings of the Royal Society B 278:2105–2111. Annual Review of Physiology 44:97–107. Journal of Experimental Biology 206:1739–1749. Proceedings of the Royal Society A 465:1539–1559. Journal of Theoretical Biology 106:189–206. Proceedings of the Royal Society B 279:975–980. Thank you for choosing to send your work entitled “The bigger they are, the wider they turn: Mass defines hunting options in cursorial predators”: for consideration at eLife. Your full submission has been evaluated by Ian Baldwin (Senior Editor), a Reviewing Editor, and three peer reviewers, and the decision was reached after discussions between the reviewers. Based on our discussions and the individual reviews below, we regret to inform you that your work will not be considered further for publication in eLife. In addition to the reviews that you can find below, there was a lively discussion that followed the initial submissions of the reviews, and we wanted to capture some of the salient points of this discussion, in the hope that this may of assistance to you. First, we wanted to emphasize that there was overall enthusiasm for the simplicity and elegance of the approach, but that perhaps more details need to be added to the model. In addition to broadening the focus of the paper taxonomically, including additional complexities of the predator-prey pursuit, in particular the element of endurance would greatly broaden the appeal of the analysis. In this manuscript the authors modelled predator-prey interactions with a focus on body-mass differences and how these differences constrain hunting and escape behaviour. A number of simplifying assumptions are made to break down the interaction into simple components and the predictions are compared to data from the literature (including recent novel data on locomotion performance obtained from sophisticated tags on moving animals). In the model the authors consider primarily speed and cornering ability (as a function of mass). When comparisons with real data from predators and prey are made, it seems obvious that differences between predator and prey in endurance should also play an important role especially given that you considered the full duration of hunts. Endurance is part of the discussion but does not form part of the model generating predictions. Another factor that strikes me as potentially important is the ability to anticipate turns of prey. But I suppose this is partly covered by the authors' consideration of reaction time. Nevertheless if predator can well anticipate cornering of their prey then this could compensate partly of the disadvantage of greater turning angles due to greater mass. This is an interesting theoretical paper that takes into account simple biomechanical principles in order to explain the behaviour of predators and prey. Manoeuvrability is certainly a major factor in predator-prey gambits, although it is largely overlooked in certain taxa and therefore this manuscript is potentially a welcome addition to the literature. My main comment is that this paper really mainly applies to terrestrial mammals, and the authors should clarify this point right from the title and the Abstract. A lot of work on manoeuvrability and predator-prey interactions has been done on aquatic and aerial species. Some of that work may actually be relevant for this manuscript as well, at least in the discussion for comparing various predator-prey situations. Among other, potentially relevant work (both theoretical and experimental) on the effect of manoeuvrability (and scaling, in some of the manuscripts listed below) on predator-prey interactions of non-terrestrial animals is: van den Hout (Behav Ecol, 2010), Hedenstrom and Rosen (Behav Ecol, 2011), Coombs et al. (J exp Biol, 2011), Warrick (C J Zool, 1998), Weihs and Webb (J Theor Biol, 1984), Weihs (Fisheries Bulletin, 1981), Webb and DeBuffrenil (Tran Am Fish Soc, 1990), Domenici (Comp Biochem Physiol, 2001; J exp ; Biol, 2011), F. E Fish (Performance constraints on the manoeuvrability of flexible and rigid biological systems, pp. 394–406 in: Proceedings of the Eleventh International Symposium on Unmanned Untethered Submersible Technology). While the citations in most of the paper are on terrestrial animals, Walker et al. (2005) is on fish. I think the authors should either: 1) expand their view by taking into account aerial and aquatic species as well or 2) more clearly choose to deal with terrestrial animals only. Introduction: The scaling trend with body mass has been examined in aerial and aquatic species. This should be clarified here. Results: Here the authors analyse two cases: 1) the predator cuts corners and 2) the predator overshoots. What about the case of a predator that manages to follow the prey precisely? (Is this the case of a very short reaction time? This could be clarified). Figure 4 and Table 1: The stats are a little bit confusing. The authors should specify what they are comparing as well as the degrees of freedom. The authors suggest that the best situations for a predator are those when 1) the prey makes multiple rapid turns or 2) the prey runs in a straight line. This seems contradictory and further explanations (perhaps an additional figure) would help. Discussion: The authors mention topography and vegetation as one of the factors that can alter the game rules. This is an important point and deserves a little bit more discussion. Model: The scaling of turning radius also depends on the scaling of maximum speed. Predators or prey may however decide to run slower in order to produce a tighter turning radius. Alan Wilson et al. (2013) for example suggest that peak running speed is unlikely to be used by cheetahs in the final stage of their successful hunts because it would imply poor manoeuvrability since at this speed cheetahs would take as long as 6 s to perform a 1800turn. There are further general considerations about speed and manoeuvrability that could be made in the Discussion, for example about the trade-off between speed and accuracy (Chittka et al., 2009) as well as the principles of unpredictability (Jones et al. Behav ecol, 2011). The paper is interesting, the derivation of a simple scaling law for predator prey pursuit interactions is appealing, but the authors use an extraordinarily naïve pursuit law. This is really surprising because there is a deep and rich literature dealing with the pursuit problem, from Achilles and the tortoise to modern missile systems. That literature is really interesting and directly applicable. The only case they have analysed is a very simplified version of 'pure pursuit' where the predator aims at the current position of the prey, and their main conclusion is a very well known problem for pure pursuit – the closing stages of the trajectory require increasing turn rates from the pursuer. This has been demonstrated from geometry. Thus the main conclusion from the paper is not novel. The paper is now much improved. I still have a few comments that the authors should be able to deal with. 1) Title: Now the title includes the term “terrestrial” which clarifies what type of animals are considered. However, the current title is a little bit vague, because the authors have removed the sentence “The bigger they are, the wider they turn”. I suggest reinstating it, therefore using this full title “The bigger they are, the wider they turn: Mass defines limits hunting options in terrestrial, cursorial predators”. 2) Introduction: Across these terrestrial studies. Rewrite as “across these studies on terrestrial animals”. 3) Results: “A third scenario might be where the predator follows the prey trajectory precisely, in which case there is no benefit to either party.” This is not immediately clear (probably because it takes into account manoeuvrability only). If a predator follows a prey precisely, it will eventually catch it as long as its speed is higher than that of the prey. I suggest rephrasing this sentence and adding a panel in Figure 1, that takes into account this simple possibility. 4) “Although a single turn may not lead to capture or escape of the prey, multiple turns with the same outcome will can do so (Figure 1).” It is not clear what type of outcome the authors are referring to. 5) The authors reply that “cornering” was defined in the Methods section. I could not find this definition. 6) Discussion: Work by Jones et al. (2011) is not in fluid media. It was done using computer videos and human subjects as predators (volunteer students). The theory behind protean behaviour (see also the seminal work by Humphries and Driver in the ‘70 s) implies catching the predator by surprise, for example by turning left just after a right turn. Increasing the amount of turning may make the path of the prey more unpredictable, (e.g. by using random turns just before the critical phase, as suggested by the authors) and this is a general consideration that may apply also to a 2D environments. 7) Methods: “Thus, starting from a speed of zero, any direction taken by the prey as a response to this, that is not directly away from the predator, will reduce the inter-party distance correspondingly.” The situation is not so simple. Previous models (e.g. Weihs and Webb, 1984; Domenici et al., 2011) suggest that the optimal angle of escape for a prey depends on the ratio of predator speed/prey speed. For prey speeds higher than predator speed, the prey should escape directly away from the predator. However, for predator speeds that are higher than the prey speed, the prey should escape at 90° from the predator attack path. 8) In addition, stotting may allow a sudden change in escape direction, unlike running. This strategy is common in some ungulates (e.g. Stankowich and Coss, 2007). 9) Methods: “which explains why observations report that prey typically do indeed initially run directly away from the predators”. While this is generally true, it is not always the case. See for example review by Domenici et al. (2011) cited in this manuscript. 10) Methods: “In this regard, typical terrestrial 'prey', such as ungulates, have large panoramic visual fields with laterally facing orbital margins (Heesy, 2004) and so may be able to assess the movements of their pursuers as well as their pursuers can assess them.” In some prey, escape trajectories may aim at keeping the predator just within the limits of the prey's visual field (Domenici et al., 2011). Therefore, not all angles of escape may be the same, for a prey chased by a predator. There may be optimal ones, from a sensory perspective, that allow keeping track of the danger. Indeed, if a prey has a blind zone posteriorly, turning itself could be a way to keep track of where the predator is. While this paper is mainly about the biomechanical principles that may determine predator-prey strategies, some considerations on the sensory systems of predators and prey would increase the ecological and behavioural relevance of this work. We have now clarified elements of the model in some detail (see below) and, following the advice of reviewer #2, limited our treatment to terrestrial predators. This allows us to keep the model simple while demonstrating its salient features. We have also added the requested element of endurance and included an extra figure for this (see below). Both the references mentioned by the reviewer are excellent (we were aware of Shneydor but not Siouris) and we have incorporated them into the manuscript now, expanding our consideration of pursuit strategies considerably in the Methods. A major mistake (pointed out by reviewer #2) was that we were not explicit about only dealing with terrestrial pursuit systems, which are fundamentally different with regard to manoeuvrability and speed to aerial systems. The issue of missile manoeuvres becoming more difficult towards the end of the chase is obviously critical for flight pursuit, not least because airborne predators (or missiles) cannot reduce speed without losing lift, with all the stability and turn radii complications that this engenders. In addition, missiles typically have much greater speed than their targets, which is not the case in many terrestrial encounters. Having now clearly specified that we only consider terrestrial predators, many of these particular problems become less critical (terrestrial predators actually have smaller turn radii with decreasing speed and are liable to have greater stability and accuracy – see e.g. Chittka et al. (2009) and references therein now cited in our manuscript). Actually, we did consider strategies other than ‘pure pursuit’ in earlier iterations of the manuscript but we removed them in an attempt to present the most simple scenario. This was obviously a mistake. Clearly, because different pursuit strategies change trajectories, they may be expected to change the conclusions drawn regarding the primary focus of the manuscript; that of the effects of mass on turn radius. In fact, the general conclusions do not change because all terrestrial animals have operate within minimum turn radii rules which are critically and profoundly affected by mass and these define the major features of turn gambits. However (and with hindsight this seems obvious now), we should have discussed this in the manuscript because otherwise readers might wonder whether we were being naïve (as the reviewer did). This is a very fair point, not least because predator-prey pursuits consist of more than one turn gambit (as our own data from cheetahs make clear). We were simply worried about ‘over-cooking’ our model. We have now incorporated the issue of endurance by providing a simple metabolic power diagram that highlights overall accumulating energy costs during a pursuit according to speed, turns and straight-line sections in pursuits. Although the metabolic cost of turning has been quantified for humans (by us – see Wilson et al., 2013c – Ecology Letters, cited in the manuscript), and found to be substantial, our study did not quantify the relationship between angular velocity and VO2, which would have been most useful for insertion into the model. Our solution now simply presents a single scenario of a chase consisting of multiple turns and straight-line sections at fixed speeds for both predators and prey. A new figure illustrates how over- or under-shooting by the predator may affect the outcome of the chase where endurance is represented by available energy limits. Incidentally, we have now just repeated the ‘VO2 versus turning’ experiment that we published in Ecology Letters, this time varying speed and angular velocity using 22 participants. Thus, we will shortly be in a position to define the relationship between the variables more completely. The issue of predicting prey trajectory is now included in the manuscript (see remarks to reviewer #3). Currently, we point to the fact that whether predators employ pure pursuit or some predictive pursuit rules does not change the fundamental nature of the chase consisting of a series of straight line sections and turns (although it does change the details of the turn trajectory). However, the issue of overshoot or undershoot remains the same irrespective of pursuit strategy (as reviewer #3 points out, this general phenomenon has been known from geometric studies for some time) and where it becomes specifically of interest to us is how the mass affects the degree of overshoot and/or undershoot. This is a very pertinent point and it was, in fact, only on re-reading it from the ‘non-terrestrial’ perspective, that we realised how incompletely it was framed. We have now made multiple changes throughout the manuscript (including in the title) to make it explicit that we only deal with terrestrial cursorial animals. We have also, though, incorporated many references from aerial and aquatic species in ‘setting the scene’ (see also comments below). These are excellent suggestions, particularly for the framework. We have now incorporated almost all of these (which necessitates an expanded literature section but one which, we feel, helps create a more solid contribution). While the citations in most of the paper are on terrestrial animals, Walker et al (2005) is on fish. I think the authors should either: 1) expand their view by taking into account aerial and aquatic species as well or 2) more clearly choose to deal with terrestrial animals only. Given the extensive literature on predator-prey interactions in fluid media and the substantial differences between fluid medium locomotion and terrestrial locomotion (to which we now refer), we have adopted the reviewer’s suggestion to define that we only deal with terrestrial animals. Note that we have, though, included much of suggested literature in the introduction to provide a more complete overview of the problem. This is an important point because it appears that we have not given this option consideration. This has now been clarified. This has now been done in the Methods section. We have now clarified the stats. We have now elaborated on this but have not introduced an extra figure since we already have an extra figure detailing energy use during extended chases (see reply to reviewer above). This is indeed important and has now been expanded. Model: The scaling of turning radius also depends on the scaling of maximum speed. Predators or prey may however decide to run slower in order to produce a tighter turning radius. Alan Wilson et al. 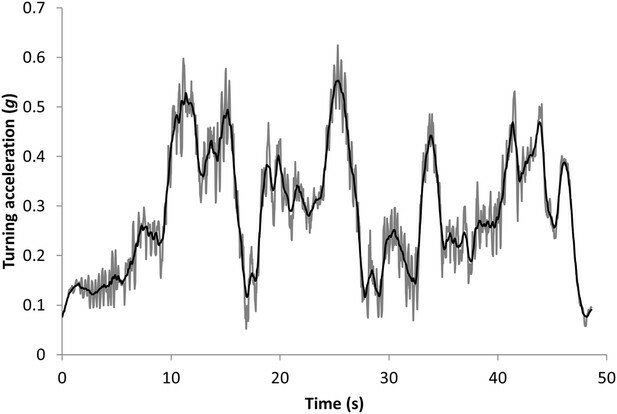 (2013) for example suggest that peak running speed is unlikely to be used by cheetahs in the final stage of their successful hunts because it would imply poor manoeuvrability since at this speed cheetahs would take as long as 6 s to perform a 1800 turn. This point has now been incorporated into the text. There are further general considerations about speed and manoeuvrability that could be made in the Discussion, for example about the trade-off between speed and accuracy (Chittka et al. 2009) as well as the principles of unpredictability (Jones et al. Behav ecol, 2011). Both these points have now been incorporated into the text. The referee makes a very valuable point and also makes another problem apparent to us. Many thanks for highlighting the necessity of referring to the first of these, specifically the pursuit law issue, but also, indirectly making us aware of a second issue (see below). In fact, in an earlier version of this manuscript, we did consider various pursuit law options, documenting how they changed chase parameters. 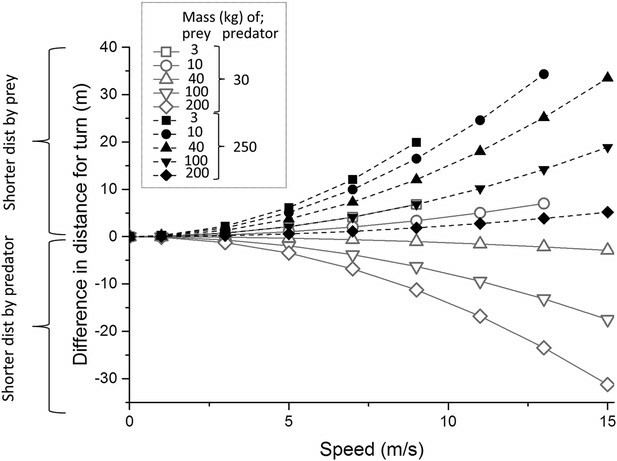 The reason that we dropped this was that, although different pursuit strategies result in different predator trajectories and different times to predator-prey contact (see Author response images 1, 2, and 3), they did not change the essence of the functional response of distance between predator and prey according to whether the predator under-cut or overshot the prey trajectory (Author response image 3) (as the referee points out, this is well known from geometric studies). Clearly this needs to be stated explicitly within the manuscript and we have now done this at length, referring to the literature that the referee recommended (as well as introducing others). Trajectories for a predator starting a chase at 55 m from prey (greater than the predator’s minimum radius of turn, 40 m) showing (by the continuous line) the predator turning to follow the prey with its minimum turn radius until the prey is directly ahead and then adjusts its direction continuously to keep the prey dead ahead and (by the dashed line) the predator turning with its minimum turn radius of 40 m until it is in a direction that corresponds to the anticipated point of interception with the prey whereupon it continues in a straight line (constant bearing) to that point. Predator and prey speeds are 20 and 15 m/s, respectively. 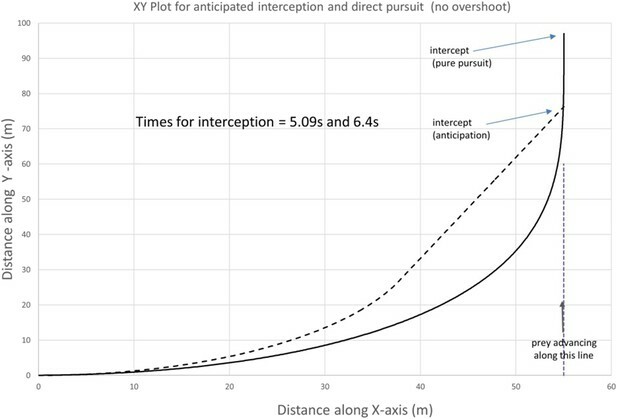 Times until interception are shown within the plot. Time vs distance between predator and prey plot for the overshoot scenario depicted in Author response image 2 for direct (blue dashed line) and anticipatory (red continuous line) pursuits. Note how, in all scenarios, although the two different pursuit strategies result in different values of the outputs, they do not change the fundamentals in the form of either the trajectories or the distance vs time plots (cf. Figure 2 in the manuscript) with either over-shoots or corner-cutting depending on turn radius. Importantly though, given that the degree of this under- or overshoot is profoundly affected by mass (the main purpose of our investigation), we concluded that it was easiest to present just one pursuit scenario rather than clutter up the work with multiple plots and outputs that showed no great differences between them within the context of the issues being discussed (note that Figure 1 in the manuscript is essentially schematic and Figures 3–6 do not contain pursuit strategy-dependent outputs). We ended up choosing the pursuit rule that seemed most supported by the literature for terrestrial running animals, direct pursuit. However, the referee does make a vital point, (A) that readers need to know that we have considered various options and (B) that choice of option does not change the overall patterns that we use to progress to the nub of the matter, namely that of predator and prey mass. The second issue (see above) is that we clearly did not emphasize enough that the main purpose of the work was not to identify, reiterate or copy the geometric conclusions shown by others (although we are obliged to consider them to set the groundwork, hence the election of our model), but to examine the specific effect of mass on the possible strategies and outcomes in gambits between running predators and prey. We have now modified the text to try and make our primary aim clear. We had included “The bigger they are, the wider they turn” in the title but we were advised to avoid a two-part title. 3) Results: “A third scenario might be where the predator follows the prey trajectory precisely, in which case there is no benefit to either party.” This is not immediately clear (probably because it takes into account maneuverability only). If a predator follows a prey precisely, it will eventually catch it as long as its speed is higher than that of the prey. I suggest rephrasing this sentence and adding a panel in Figure 1, that takes into account this simple possibility. This third possibility has been added to the paragraph and a panel added to Figure 1 that shows this course of events. This has now been corrected (and clarified). The identification of corners was in the second paragraph in the section entitled ‘Field trials to examine model predictions on free-living cheetahs’. This section has also now been elaborated somewhat since it was indeed rather cursory. Sorry, our mistake regarding Jones et al. (2011). We have also highlighted the potential value of protean behaviour and referenced Humphries and Driver here too. 7) Methods: “Thus, starting from a speed of zero, any direction taken by the prey as a response to this, that is not directly away from the predator, will reduce the inter-party distance correspondingly.” The situation is not so simple. Previous models (e.g. Weihs and Webb 1984; Domenici et al. 2011) suggest that the optimal angle of escape for a prey depends on the ratio of predator speed/prey speed. For prey speeds higher than predator speed, the prey should escape directly away from the predator. However, for predator speeds that are higher than the prey speed, the prey should escape at 90 degrees from the predator attack path. Yes, indeed, a very good point. This is particularly true when distances between predators and prey are minimal at the onset of the chase in conditions approaching the ‘sneak attack’ of e.g. Pumas (see recent publication by Terrie Williams in Science (2014)). We have modified the manuscript to incorporate this point and cited appropriately. This has now been noted in the manuscript, together with the reference. 9) Methods: “which explains why observations report that prey typically do indeed initially run directly away from the predators”. While this is generally true, it is not always the case. See for example review by Domenici et al (2011) cited in this manuscript. This has now been added, as has the citation. Again, this is a very germane point, which we have now included, together with the reference to the work by Domenici et al. We have, however, kept this brief and to the point since it was leading more towards the ideal escape trajectories of the prey than to the pursuit strategy of the predator, which was the prime function of this part of the paragraph. We could expand it somewhat in the Discussion if deemed necessary. This study was supported by the Royal Society (2009/R3 JP090604) and NERC (NE/I002030/1) to DMS. We thank SANParks and the Department of Wildlife and National Parks, Botswana for allowing our research in the KgalagadiTransfrontier Park (Permit Number 2006-05-01 MGLM) and from The Lewis Foundation, South Africa, The Howard G Buffet Foundation, National Geographic, Kanabo Conservation Link, Comanis Foundation, Panthera and the Kruger Park Marathon Club for financial support to MGLM. Animal experimentation: Permission and ethical clearance were granted by SANParks ethical and research committees to conduct the field research, Project Number 2006-05-10 MGMI. The study was performed in accordance with the commendations in the Guide for the Care and Use of Laboratory Animals of the National Institutes of Health. All immobilizationand collaring of wild animals was conducted by a registered individual (GM), under the direction of a SANParks veterinarian. © 2015, Wilson et al. Small animals can escape larger predators by exploiting their ability to turn more rapidly.